Disclosure: I received products to facilitate this giveaway; all opinions expressed are my own. Happy spring! We're still bundled up here in New Hampshire but Nia exclaimed that she could feel a bit of warmth in the air today. She's a bit more optimistic than I am! 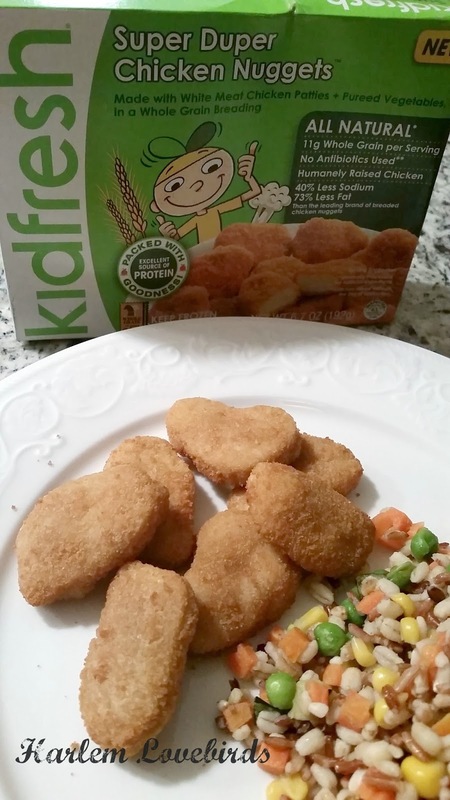 To celebrate spring and National Frozen Food Month I've partnered with Kidfresh to give a lucky Harlem Lovebirds reader 10 coupons for $40 worth of Kidfresh meals. Busy days and rushed nights often make it hard to maintain smart eating decisions and for those of you who've been around this blog a while, you know we're huge fans of Kidfresh. Knowing that I can give my daughter tasty nutritious food, packed with veggies (instead of metal, as was in recent news) makes me feel good! It's almost like nutrition insurance when I open my freezer and see the cute green packaging staring back at me. Super simple, quick and healthy! Growing up when I'd request fast food my mom would reply that we could have McMommy's instead, and I now doing the same with Nia! I fix the Super Duper Chicken Nuggets and Wagon Wheels Mac+Cheese most often and find myself eating it too paired with a healthy side. I'm still in awe every time I eat it trying to figure out how they get the veggies in their meals without compromising taste! Now there are some things Nia won't compromise on such as forgoing ketchup with her Kidfresh nuggets, but as all parents know, you have to pick your battles. To win a pack of 10 Kidfresh coupons simply enter via the Rafflecopter below - it's super simple as always! The giveaway opens today, Friday, March 20 ending on Monday, March 23 with the winner announced on Tuesday, March 24 (open to U.S. residents only). Be sure to check out Kidfresh's website for full nutrition info as well as follow on Facebook and Twitter for latest product news.